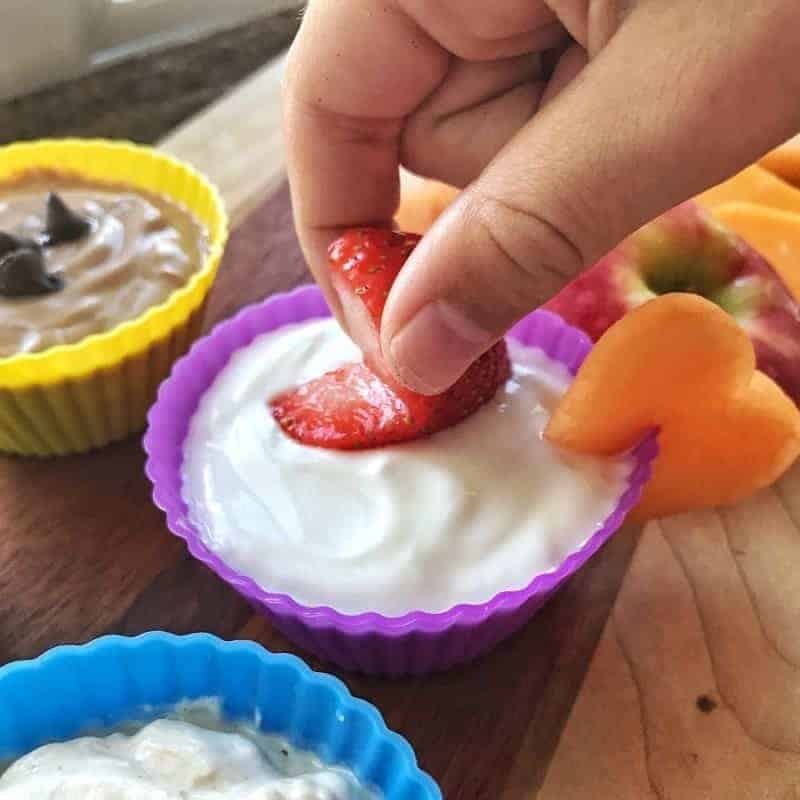 Yogurt fruit dips and veggie dips are a great way to get children eating more fruit and veggies. These dips ideas all come together in less than 5 min. with just 2 ingredients each. THIS POST IS SPONSORED BY PRODUCE FOR KIDS. THIS POST ALSO CONTAINS AFFILIATE LINKS. AS ALWAYS, OPINIONS ARE MY OWN. Making food fun for kids helps get them to eat foods they may not normally like to eat. Cookie cutters and dip work great! 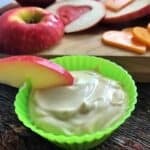 Keep reading for 4 yogurt fruit dip recipes and 4 sour cream based veggie dip recipes. For many families, this simple trick isn’t enough. For those looking for guidance with kiddos aged 3-8 years check out this great resource. For children ages, 9-12 check out this article. Pro Tip: Offer small portions of the foods my kids don’t love. Try packing 3 or 4 carrot sticks or tomatoes rather than a full bag. 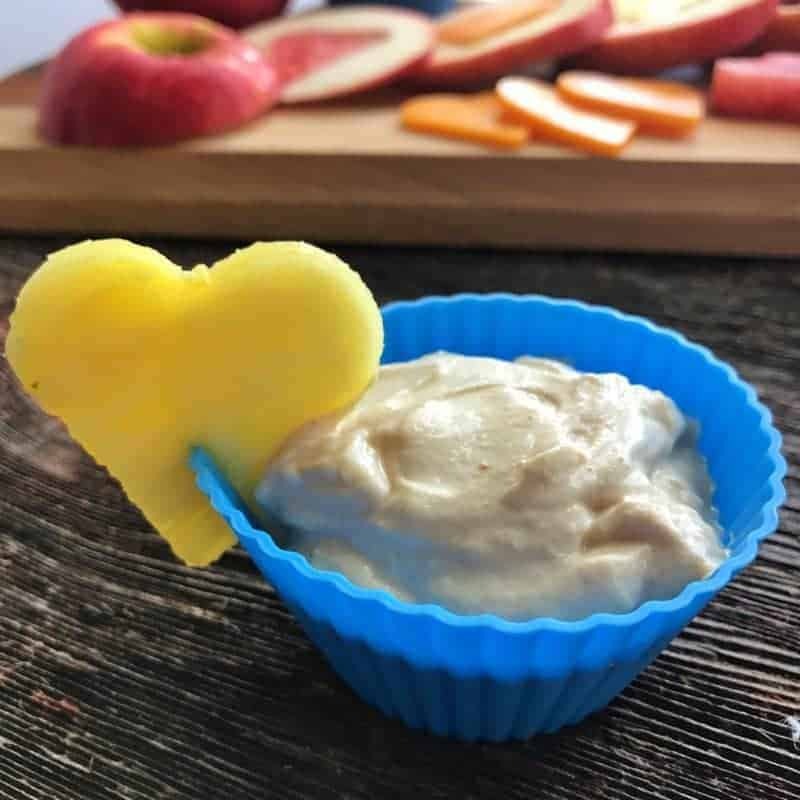 Use small cookie cutters or look around for small containers or dishes that have shapes you could use to push through the fruit or softer veggies. 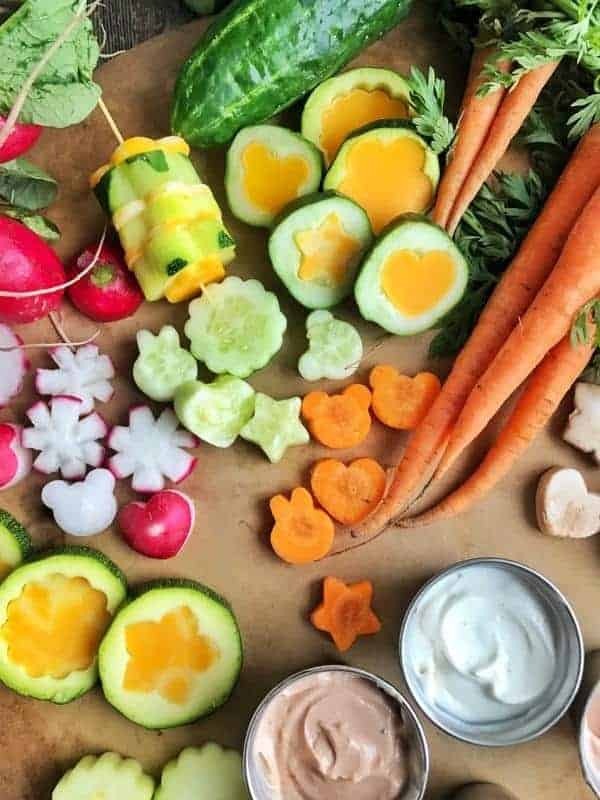 For those firm veggies like carrots and radishes, cookie cutters work best. Grab a cutting board, veggies or fruit, maybe some cheese, and you’re ready to start. 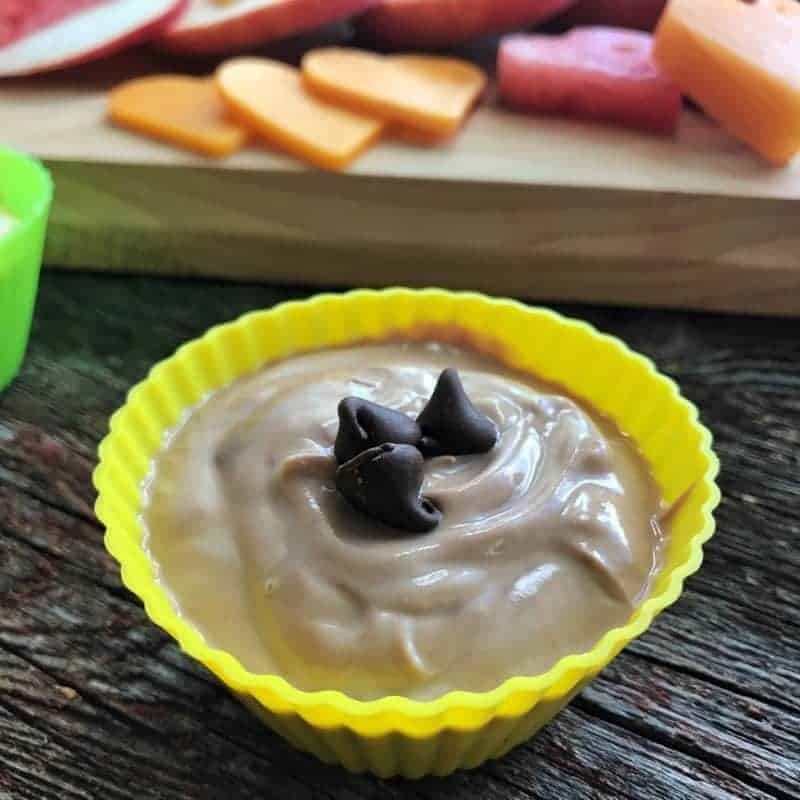 Get creative and try your kid’s favorites! TIP: To cut strawberries into hearts cut a v-shape into the top when cutting the stem off. Slice in half. Cut shapes out of the fruit or veggie, then use the same cutter to cut a piece of cheese or other fruit or veggie and fill in the space left. Mix and match or let your kids mix and match as part of the fun at lunch! The following ideas are so simple – and have just 2 ingredients! 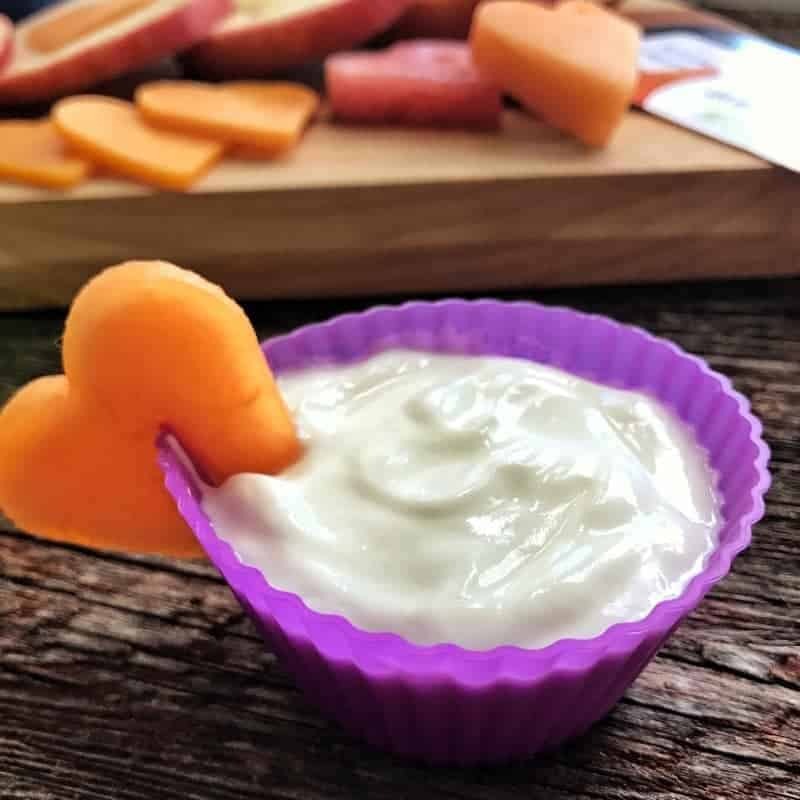 The fruit dips have a yogurt base and the veggie dips have a sour cream base. They can easily be made while packing lunches and all recipes make enough to put in several lunch boxes. Use The following ingredients to mix up fun dips! Use a base of vanilla or plain Greek yogurt. Look for brands with the lowest added sugar. If your kids are like mine, they want all the mix-ins used below in their lunchbox. I like that these dips cut down on sugar, but still give the flavor that kids are looking for. Which would be your children’s favorite? Mine liked caramel apple and marshmallow creme best. 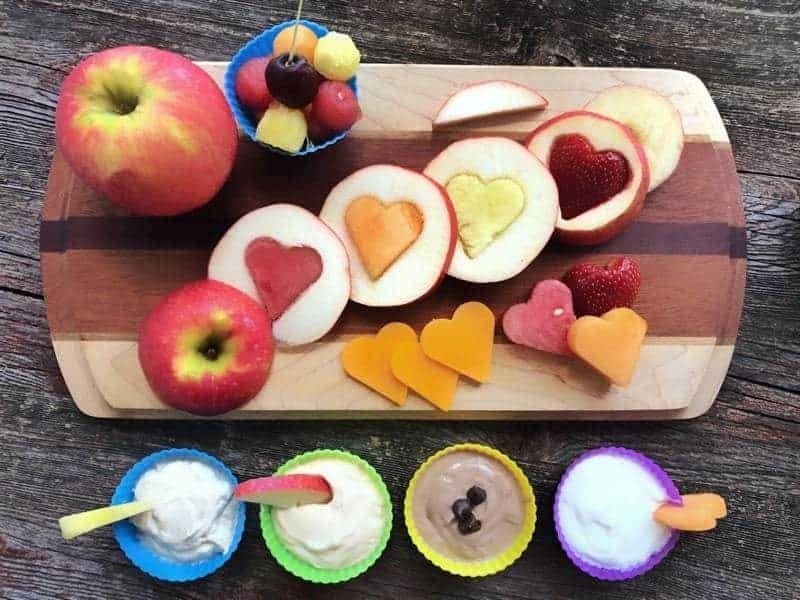 Use the following ingredients to blend up yummy fruit dips! A simple fruit dip perfect for kids and adults that has just 2 ingredients and takes less than 5 minutes to make. Other add-in ideas include Nutella, jelly, honey, and maple syrup. 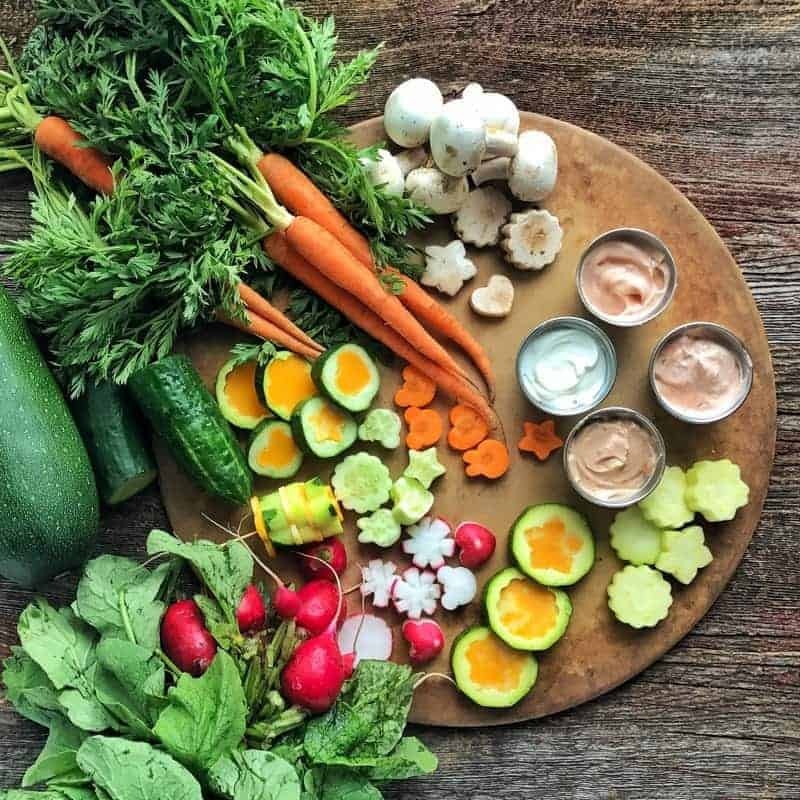 My daughter loved all these dips! Thanks for the fun ideas.